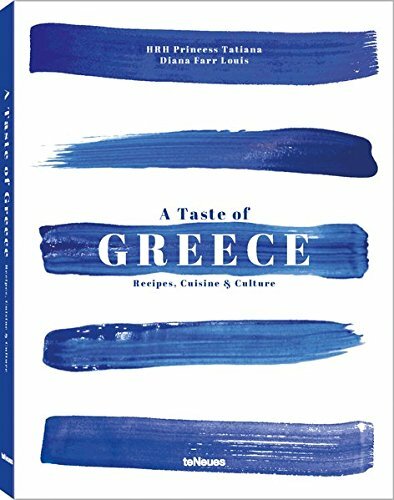 NOT JUST ANOTHER COOKBOOK, A Taste of Greece could have been called For the Love of Greece, as it became a project that brought together well-known personalities from across the world who all share a special bond with this ever fascinating Mediterranean country. They gave us their favorite recipes, told us of their much-loved foods, and opened their hearts as they shared their memories and revealed what Greece means to them. A Taste of Greece represents a collaborative effort between HRH Princess Tatiana, who has made Athens her home since 2013; Diana Farr Louis, a New Yorker who first came to Greece in 1963; and the Athens-based NGO BOROUME (�We Can�). Founded in 2011, BOROUME is the only nonprofit organization in Greece dedicated to reducing food waste and fighting malnutrition at the same time, by creating networks of food donors and receivers throughout the country. Through this book, you will see, feel, and taste a Greece that may be new to you. Most importantly, you will join a global community of active citizens who are eager to support the country they love. All proceeds from this book�s sale will support BOROUME in supplying meals for still more families and building a closer sense of community and solidarity. Food. It fuels our body and nourishes our soul. Shared, it fosters a mysterious sense of intimacy, even among strangers. Universal, it remains unique to each country, an essential element of the cultural heritage that links present and past through traditions and memories. A single bite can transport us both round the world and back in time. What else but food can awaken and create such lasting memories and deep emotions It is not by chance that, for A Taste of Greece, over 30 well-known international personalities have chosen to share their favorite local food recipes to give life to their personal connection with this beautiful Mediterranean country and shed light on its multifaceted appeal. Their stories and recipes illustrated by stunning photos will give you a real appreciation of Greek cuisine, age-old traditions, and a fascinating contemporary culture. We trust that you will become as enamored of the country and its people as they are!